Ranch – why does it taste so good? Ranch is a mayonnaise-based creamy salad dressing and dip. The dressing is incredibly popular in the States, but it hasn’t really taken hold in the UK. This may be because in the UK we don’t eat salad in quite the same way as Americans. Most American family diners and restaurants will include a salad as part of the meal, usually a small bowl as a starter, but it can be served as a side. In either case the waiter or waitress will recite a familiar mantra: ‘Will that be with Thousand Island, Blue Cheese, French or Ranch dressing…’ Most of these options are thick, cool and creamy. This is because Americans are also partial to crispy lettuces, such as iceberg and cos – and crisp lettuce goes very well with cool creamy dressings (rather than vinaigrettes which are more suited to softer leaves). When Steve and Gayle Henson opened their Hidden Valley ‘dude ranch’ in Santa Barbara, California in the 50s, it would’ve been perfectly normal to serve a creamy salad dressing on their guests’ salads – and it would’ve been similar to many dressings that Americans instinctively make – mayonnaise and milk concoctions shaken in a jar. The Hidden Valley ‘Ranch’ dressing was something Steve had worked at and on for a while and clearly he’d hit on a winning formula: the recipe – and name – was eventually sold for $8 million in the 70s and is now America’s best-selling dressing. Many Americans – including WDC – consider packets of Ranch an essential store cupboard ingredient. Since the mid 70’s in the UK, WDC has basked in adoration, not because of Dad’s amazing meals (though these sometimes get an honorary mention) – but because of our family’s privileged USA supply network, whereby endless packets of Ranch make their way over from America via family and friends. It’s available in a dressing and a dip version. But from either pack we make our famous Ranch dip. For such astounding gratification, it really couldn’t be simpler: sprinkle a little Ranch onto some Greek yoghurt and that’s it- Ranch dip! Just add crisps or tortilla chips. 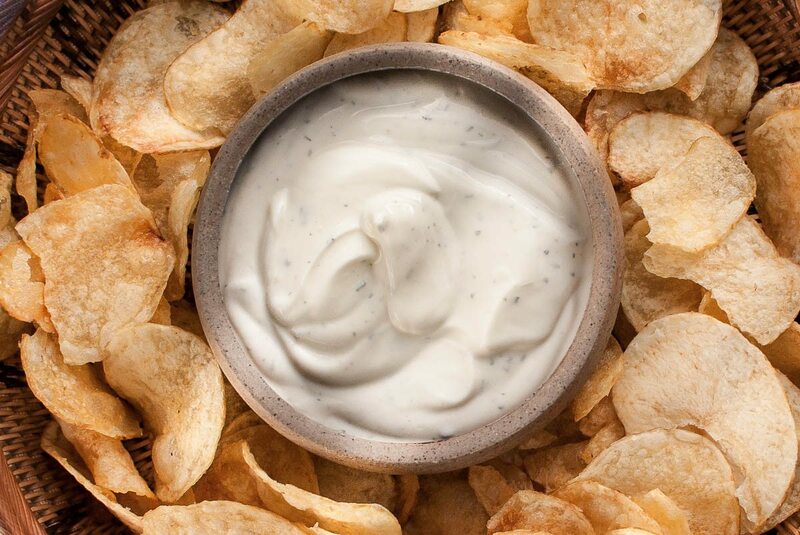 If you don’t believe me, invite a group of family and friends for a big lunch and present them with a bowl of Ranch dip and crisps as an appetizer. Soon it will be devoured. If you refill with more Ranch, this too will be devoured. I’ve seen children attach themselves to the bowl rather like an adorable wind-up toy mechanically programmed to scoop, dip and eat in perpetual motion. It’s fun watching the various methods and postures your guests will adopt to get their fill of Ranch. Some will take less frequent dips, but balance huge dollops on their crisps, others will positions themselves comfortably next to the bowl and politely and socially disguise their need to continually dip. If you are sensitive to the practice of ‘double-dipping’ you will need to make allowances – Ranch seems to encourage the practice. Perhaps because Ranch is so good, the the mind decides it is quicker to get another hit by double-dipping than reaching for another crisp. We can start to discover the secret of Ranch by reading the ingredient list on the back of a packet. Apart from the usual artificial flavourings, chemical emulsifiers, salts, sugars and milky compounds the list includes some recognizable foods: spices, onion, garlic. There are bits of green herbs in the dressing but these are not identified. When I eat Ranch I taste dill and parsley. So with the garlic and onion we have a savoury combination of flavours that are present in garlic bread – another compelling and addictive savoury taste. Also listed is buttermilk (the original dried packet version was intended to be added to buttermilk, but to simplify the process the buttermilk flavour is now included in the dried ingredients). In the UK buttermilk is rarely seen, however, in the States it is very common and widely used in cooking. Buttermilk is the liquid that is left after making butter from cream – but it’s probably now a general fermented milk product manufactured very much like yoghurt. Being acidic, it is used in cooking in combination with baking powder to make non-yeast doughs and batters rise. It’s an essential ingredient in some American classics, most notably ‘buttermilk’ pancakes, but also shortbread – a scone-like biscuit. Being similar to runny yoghurt it is also used as a marinade for such staples as Southern-fried chicken. Ranch contains monosodium glutamate (msg). Msg is one of the most important ingredients in Ranch – making Ranch from scratch is possible but it will never taste the same without the msg. I wonder if the Hensons would have put msg in their original Ranch dressing. We know that msg enhances savoury taste sensations – so it should make that ‘garlic bread-taste’ even more compelling. Msg is widely available in the USA, sold in the herbs and spices sections of supermarkets as ‘Accent’. So the Hensons would surely have had jars of msg in their kitchen. To really understand the effects of msg, you need to know about umami, one of our five basic tastes. It stimulates salivation in the mouth, creating a very pleasant flowing sensation on the back of the tongue, the back and roof of the mouth. In combination with other savoury tastes it creates a warm and unctuous roundness that seems to blend and balance all other tastes in the mouth. No wonder manufactures will find any way they can to introduce it into our foods. Just as Hidden Valley has done in Ranch. So there we have it: Ranch is a cool, creamy, savoury and fresh dressing and dip that stimulates your tastes and appetite. But be careful, the Hensons were made millionaires for a very good reason – this stuff is dangerously good. Please consume responsibly. There are a few ways to make Ranch Dip. To make the dressing version dilute with milk until the consistency of single cream. The ready-made packet method. This is simplest and easiest way to make Ranch dip. Buy the product and follow the instructions. The ready-made WDC method. This is the most reliable and probably best method. Get your hands on a packet of Ranch dip and add about 1/3rd of the pack to a 500g tub of original ‘Total’ Greek yoghurt. Let it rest in the fridge for half an hour. The make your own packet of Ranch method. This works – but you need to find a source for your garlic powder and onion powder. I have found the garlic powder from Indian grocers too strong. Instead use Spice Mountain‘s products from Borough Market. You also need to buy dried dill, tarragon and parsley (make sure your jars are ‘fresh’). Mix the ingredients in list 3. Season with salt, pepper and lemon – you will be surprised by how much these basic seasonings will make a difference – you will want to add more than you would think. Let it rest for half an hour in the fridge where the flavours will develop and strengthen, taste again and adjust any of the ingredients to preference – the dill, onion and garlic are the critical ingredients, but be careful you don’t over do them. NB: once you hit on the precise proportions to your taste – make up another lot doubling or quadrupling the quantities and keep in an airtight container. You will now have your own supply of Ranch powder ready for an emergency. The fresh Ranch dip version. This also works well – a great fresh dip in true Ranch-style. Just add the fresh versions in the ingredients list 4. Adjust each of the ingredients to taste and season (see note in method 3). Chop and mix into the yoghurt and rest for half an hour in the fridge.